Need to upgrade your Prusa i3 Mk2S, Prusa i3 Mk3, or other 3d printer with low friction bearings? Look no further. These bearings do not rely on ball bearings which can get jammed or clogged over time and scratch your rods. These bearings are made of natural low friction Drylin which is impregnated with a lubricant. 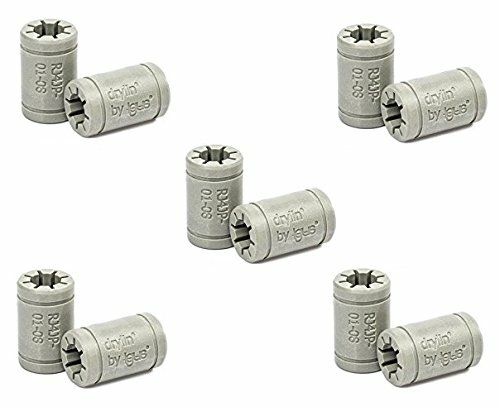 This 10 pack will replace your X, Y and Z axis on your Genuine Prusa i3 MK2S, MK3, or other 3d printer that uses 10 bearings. These high quality RJ4JP-01-08 Solid polymer Linear bearings are a direct replacement for the metal LM8UU bearing commonly used in many 3D Printers. Ideal for RepRap, Prusa, Mendel, etc. Igus RJ4JP-01-08 is compatible with 8mm rods. These high quality components are made in Germany. These are a lubricant-free alternative to ball bearings with a long life. These bearings are quickly installed, secured by circlips. Light and clean, these bearings are typically used in applications such as 3D printers, gantries, CNC mills and other sliding machines that need a low friction bearing.